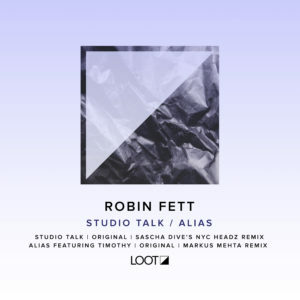 Amsterdam’s Robin Fett is making all of the right moves in all of the right places and brings his magic back to Loot Recordings for his third release that includes classy remixes by Sascha Dive and Markus Mehta. The first cut ‘Studio Talk’ emanates pure energy with crisp, punchy drums all wrapped around a thick, warm bass line. The tough groove chugs along, giving it necessary boom for the clubs, and is layered with trippy conversation and moments of smashing sounds that lends the right amount of chaos to make it stand out. Sascha Dive, one of Germany’s purveyors of all things deep, also returns to the label for a mesmerizing eight minutes of deeper house grooves. His interpretation is structured with stuttering, warm key hits and rising synths where repetition is the trick that creates the magic. Teaming up with Timothy, Fett’s ‘Alias’ is a stripped back affair of techier house with a pounding rhythm and energetic arrangement of builds and breaks. On remix duty is Munich’s maestro Markus Mehta, who turns in a choppy, modular version that’s an electronic soul symphony. Loaded with playful stabs and a lock tight arrangement of hats and drums, this one is for the robots on the dance floor.